Hbxg Dozer functions like hydraulic dozers through their feature of pilot joystick hydraulic control and hydraulic direct drive motors. These advanced and latest technology hydraulic dozers equipped with elevated sprocket and Cummins engine for better performance than the other dozer models falling in range. Hbxg Company model Sd7n and ty165. These dozers include a set of direct drive hydraulic motors which are low speed, high torque variable motors not limiting themselves to two-speed like other final drive motors. Pilot joystick hydraulic control makes it operator friendly resulting in smooth driving and better operator control system of the hydraulic dozer. Hydraulic dozers with such motors can operate over a significant range of speeds proving much higher efficiency and throughput and low maintenance costs. Such features make the machine last longer, improves durability and provides excellent stability and balance. 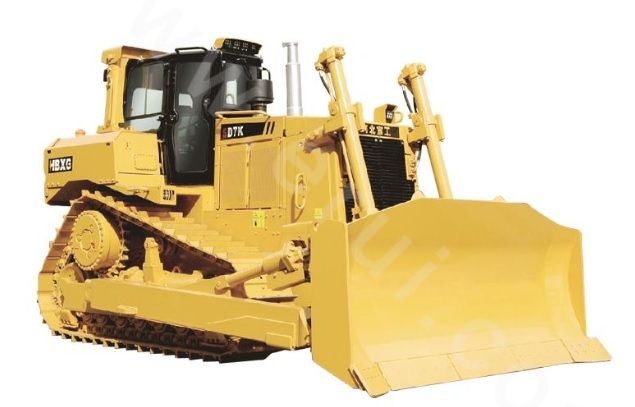 HBXG Bulldozer,More powerful engines, better tracks, more reliable drive tracks, raised cabins and instead of the usual cable operations, hydraulic arms were some of the important improvements included in the bulldozer development. More precise blade manipulation was made possible by hydraulic systems. Transmission - Planetary, power shift transmission with three speeds forward and three speeds reverse, speed and direction can be quickly shifted. Steering clutch - The steering clutch is hydraulic pressed, usually separated clutch. Braking clutch - The braking clutch is pressed by spring, separated hydraulic, meshed type. Final drive - The final drive is two-stage planetary reduction gear mechanism, splash lubrication.